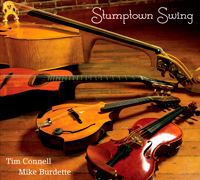 Led by internationally-acclaimed mandolin virtuoso Tim Connell, Stumptown Swing features swinging groove and gorgeous acoustic instruments played with intelligence and passion by four masters of their craft. Tim Connell (mandolin) and Mike Burdette (guitar) of Rio Con Brio formed the group after nearly a decade of playing swing gigs with Portland's best acoustic musicians. They snapped up the hottest upright bass player in town, Keith Brush (Stolen Sweets, Pete Krebs Trio, Blue Cranes) and are proud to feature their long-time friend and collaborator, the absolutely pyrotechnic violinist, Ben Blechman. Stumptown Swing is a set of hot, cool and sultry classics, featuring swinging groove and gorgeous acoustic instruments played with intelligence and passion by four masters of their craft.